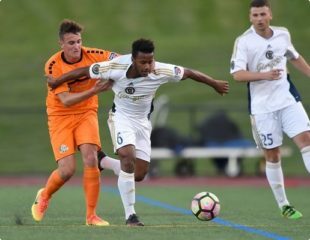 Reading United AC, Philadelphia Union’s PDL affiliate, saw four of its former players drafted in the MLS Superdraft Friday, with two of the players drafted in the top 15 overall. Syracuse midfielder Mo Adams and Florida International University defender Paul Marie were drafted 10th and 12th respectively. San Jose Earthquakes selected Paul Marie 12th overall, using one of their international slots on the Frenchman. “Mo was expected to go high,” says McCann, “but for Pauly I think it’s a great testament to him. He’s put himself in that position.” The outside back had a solid three year career at Florida International University, where he started 49 of his 52 games played, scoring 12 goals and grabbing 14 assists. On top of his college accomplishments, Marie is Reading United’s all time scorer. Reading continued to boast draftees in the second round, as Coastal Carolina forward Frantzdy Pierrot was drafted by Colorado 27th overall and Wisconsin forward Thomas Barlow went to New York Red Bulls at the 39th overall pick. The 6’4″ Pierrot was a key in Reading’s attack, scoring 13 goals over 24 games plus three goals in Open Cup play. The club has met their goal too, year after year after year. At least one Reading player has been drafted in the first round of every draft since the team became “Reading United” in 2010. Union fans will remember the Union drafting Reading alumn Keegan Rosenberry second overall in 2016. The club currently boasts 19 players in MLS including those drafted today, with four on the Union: Ray Gaddis, John McCarthy, Keegan Rosenberry, and C.J. Sapong. I don’t live to far from Reading and Love watching Utd. play. Young Kids trying hard to make it to the next level!